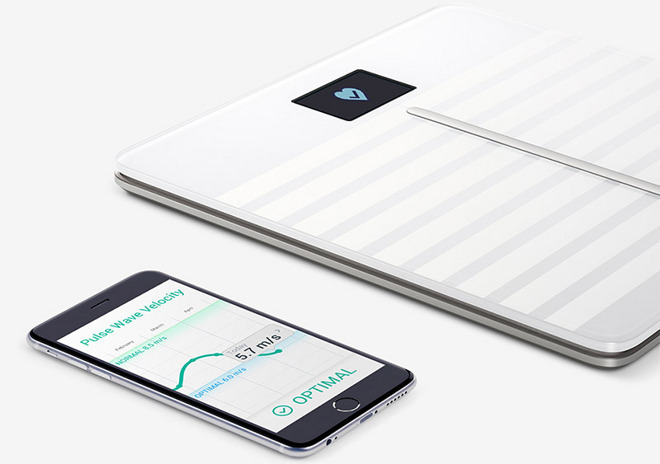 Withings on Wednesday launched a fourth-generation Wi-Fi connected scale called Body Cardio, offering users access to cutting edge cardiovascular health measurements formerly restricted to clinical settings, and other key health metrics, right on their iPhone. The data is made possible thanks to pulse wave velocity (PWV) measurements, which are the speed at which heartbeat-generated vibrations spread out along the arterial wall. High PWV indicates stiff arteries or high blood pressure, while low readings suggest soft, healthy arteries. To bring PWV into the home Withings developed a system sensitive enough to detect slight variations in weight caused by forces exerted each time the heart pumps blood in the aorta. Using impedance plethysmography at the foot, Body Cardio calculates pulse transit time (PTT), or the time it takes a systolic pressure wave generated at the base of the aorta to reach a user's foot. PTT readings are then used to deduce an estimated PWV. The scale also reads measures of weight, body mass index, fat, muscle, water, bone mass and standing heart rate thanks to a scientific technique called biometrical impedance. As a connected device, Body Cardio syncs with its partner Health Mate app to display graphs showing weight trends over time, step counts gathered by the iOS app or other Withings products and even the day's weather report on a built-in screen. Health Mate automatically syncs data for in-app viewing after every use of the scale. Body Cardio is 0.7 inches thick, with a flat aluminum base, footless design and heat-tempered glass surface. Withings claims the design provides accurate readings on almost material, from hard floors to thick carpet. A built-in rechargeable battery lasts up to one year between charges. Priced at $179.95, the Body Cardio is available in white and black from the Apple Store and the Withings website.